Eat your greens like my little Naturopathic Foodie! Last night was a hit in the dinner department. The kids couldn’t get enough of this salad! I sprung for wild pacific coho salmon and on the side the kids had jasmine rice with flax oil drizzled on top and some himalayan sea salt along with a colourful summer salad. 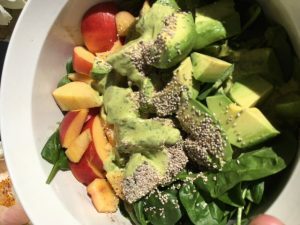 Pile nectarines on top of spinach on one side and avocado on the other. Blend all ingredients of dressing then drizzle over top of salad. Top off with chia seeds. Yesterday we had the most delicious dinner–stir fried organic chicken, steamed green beans with a roasted pumpkin seed pesto on top of japonica black rice. Super easy and super tasty! Who chose this dish? My 3 year old – the little foodie. The best part of this being is that she eats her whole dinner because she is the one who chose the ingredients (with the help of her naturopathic mama of course!). So many a night, I will ask her what 1. Vegetable 2. Protein 3. Grain (or noodles) that she wants for dinner. Then I’ll create a sauce to go on top or the side. I haven’t had a meal yet that she doesn’t like or eat when we do this. Try it at home! In a separate pot, add green beans to an inch of filtered water and simmer until you can put a fork through the bean (less than 10 minutes). In a separate pot, cook water with japonica rice 2:1 on low heat, covered. I like to use chicken or vegetable stock that I have on hand instead of water. While food is cooking, roast 1/2 cup pumpkin seeds for 3-5 minutes. Take out and put into food processor/blender with 1 tbsp flax oil, 1 juiced lemon, rind of lemon, 2 tbsp water, 1/2 avocado, handful of pea shoots or cilantro or basil and process. Add pesto to rice or beans, add chicken to dishes and presto–delish! I think there is a ‘foodie’ in all of us – kids start to become aware of the assortment of proteins, grains, veggies, fruit at a very young age. Finding ways to engage them can be challenging. Here are some helpful tips for bringing healthy and fun ways to enjoy food. 1. Involvement: ask kids to choose a favourite vegetable or fruit when in the supermarket. They can stir something or add an ingredient when cooking (like almond butter rice crispy treats from OhSheGlows.com) It all helps to get them excited about trying the snack or meal later. 2. Rainbow: Ask them the colours in the rainbow and to eat a veggie from a couple of colours. 3. 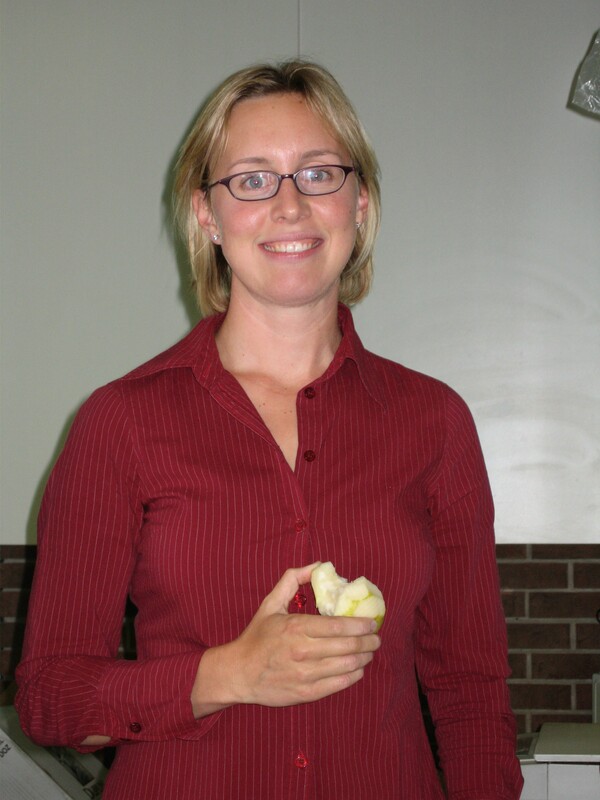 Timing: when kids start to get hungry around meal or snack time, offer them a vegetable or fruibelly starts grumbling. 4. Role model: Monkey see monkey do-if your not eating good food, chances are your kids aren’t either. Check out some recipes. Every night can be a them night i.e. Mexican Monday, Thai Tuesdays etc. You can be a foodie too….